Sometimes you want a meal that is going to fill you up but is light at the same time and soup is my go-to dish. Especially this recipe, as it is both delicious and nutritious, full of tummy loving legumes and hearty veggies. This recipe is guaranteed to leave you full but satisfied in the best way possible. 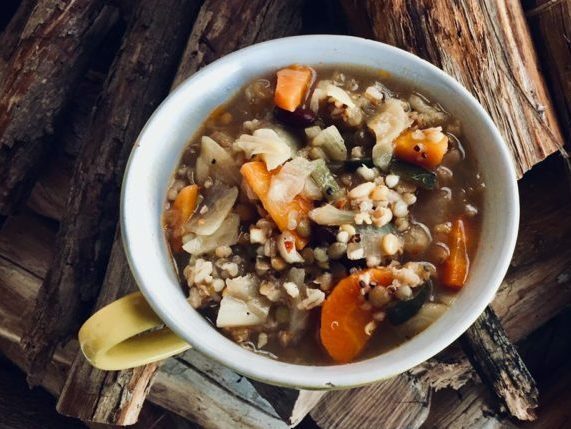 This soup is soul-warming, flavourful and nutritious and the best way to end a long tiresome day. Activate soup mix by soaking overnight in filtered water, ensuring the soup mix is submerged. In large saucepan, heat the olive oil and saute onion with the garlic. Add the zucchini, carrot and cabbage to saucepan and allow the vegetables to be coated in olive oil. Pour the vegetable stock and add chilli into the saucepan and leave on medium heat until vegetables become soft. Add activated soup mix into saucepan, season with salt and pepper and mixture allow to simmer on medium heat until beans are cooked. Serve soup warm with a crusty bread roll.